Vancouver, B.C… Corvus Gold Inc. (“Corvus” or the “Company”) - (TSX: KOR, OTCQX: CORVF) announces results from initial drill testing of four new targets and follow-up drilling on the North Jolly Jane and Cat Hill targets (Figure 1). Follow-up drill holes from the Cat Hill and North Jolly Jane targets have continued to return broad zones of low-grade mineralization with a few narrower zones of +0.5 g/t gold (Table 1). Results from four other new targets only returned low-grade mineralization over moderate to wide widths. Follow-up drill hole NB-17-445 to the higher-grade zone at the North Jolly Jane target also intersected higher grade mineralization with 4.6m @ 1.29 g/t Au. As with earlier drill hole NB-17-432 (NR-17-4, April 4, 2017, 4.6m @ 0.77 g/t Au and 12.2m @ 0.76 g/t Au) this higher-grade mineralization is associated with stockwork quartz veining along the West Jolly Jane fault zone. The North Jolly Jane target is a very large, zone of low-grade mineralization with higher grades related to large fault systems. Further work is needed in this area to identify and test the feeder structures for this large gold system. The Cat Hill target hosts a large deeply oxidized low-grade gold system. Results to date have intersected widths and grades above cutoff for run of mine oxide material over a broad area but have yet to intersect mill grade material. The size of the mineralized system at Cat Hill is encouraging and further work is needed to identify the feeder structures for this system. Results from the Cat Hill, North Jolly Jane, Jim Dandy and Savage target have demonstrated wide spread distribution of gold across the western side of the District. This extensive area of gold mineralization covers approximately 25 square kilometres and hosts three deposits. The eastern side of the District which is covered by a thin layer of high level barren alteration and is comparable in size and of similar age to the west and may host several new discoveries when further explored. 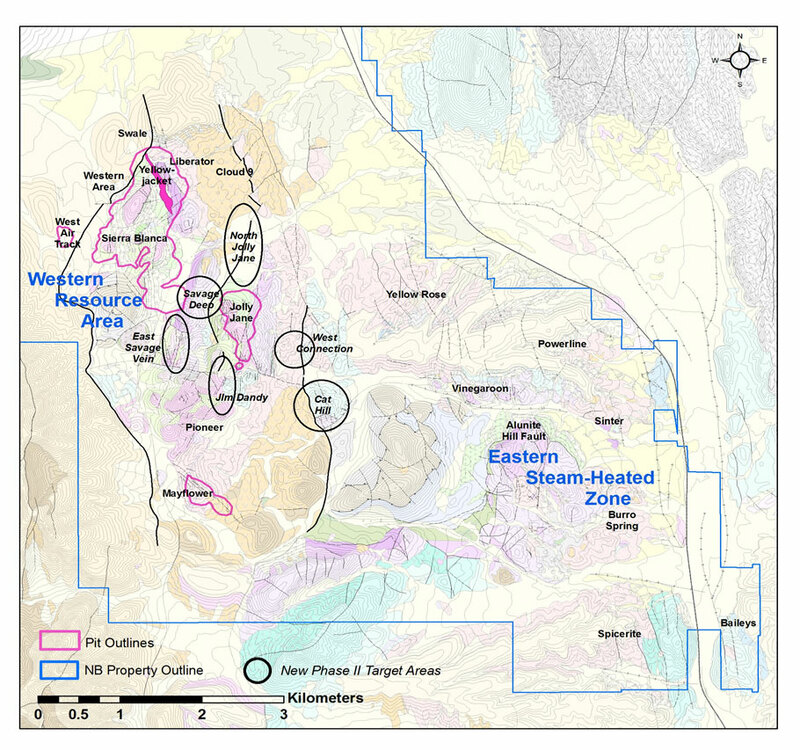 The North Bullfrog project includes numerous prospective gold targets at various stages of exploration with four having NI 43-101 mineral resources (Sierra Blanca, Jolly Jane, Mayflower and YellowJacket). The project contains a measured mineral resource of 3.86 Mt at an average grade of 2.55 g/t gold and 19.70 g/t silver, containing 316.5k ounces of gold and 2,445k ounces of silver, an indicated mineral resource of 1.81 Mt at an average grade of 1.53 g/t gold, and 10.20 g/t silver, containing 89.1k ounces of gold and 593.6k ounces of silver and an inferred resource of 1.48 Mt at an average grade of 0.83 g/t gold and 4.26 g/t silver, containing 39.5k ounces of gold and 202.7k ounces of silver for oxide mill processing. The mineral resource for the mill process was defined by WhittleTM optimization using all cost and recovery data and a breakeven cut-off grade of 0.52 g/t gold. In addition, the project contains a measured mineral resource of 0.3 Mt at an average grade of 0.25 g/t gold and 2.76 g/t silver, containing 2.4k ounces of gold and 26.6k ounces of silver, an indicated mineral resource of 22.86 Mt at an average grade of 0.30 g/t gold and 0.43 g/t silver, containing 220.5k ounces of gold and 316.1k ounces of silver and an inferred mineral resource of 176.3 Mt at an average grade of 0.19 g/t gold and 0.67 g/t silver, containing 1,077.4k ounces of gold and 3,799.2k ounces of silver for oxide, heap leach processing. The mineral resource for heap leach processing was defined by WhittleTM optimization using all cost and recovery data and a breakeven cut-off grade of 0.15 g/t. 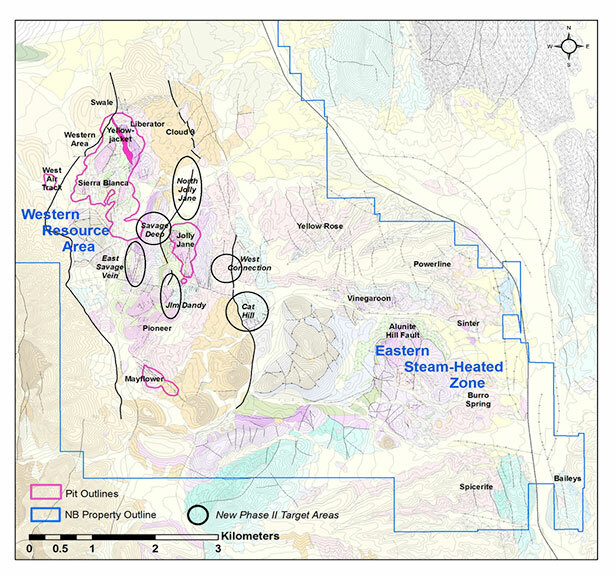 For additional information on the North Bullfrog project, including information relating to exploration, data verification and the mineral resource estimates, see “Technical Report and Preliminary Economic Assessment for Combined Mill and Heap Leach Processing at the North Bullfrog Project, Bullfrog Mining District, NYE County, Nevada” dated June 16, 2015 as amended and restated May 18, 2016 which is available under Corvus’ SEDAR profile at www.sedar.com. Corvus Gold Inc. is a North American gold exploration and development company, focused on its near-term gold-silver mining projects at North Bullfrog & Mother Lode, Nevada. In addition, the Company controls a number of royalties on other North American exploration properties representing a spectrum of gold, silver and copper projects. Corvus is committed to building shareholder value through new discoveries and the expansion of those discoveries to maximize share price leverage in a recovering gold and silver market. This press release contains forward-looking statements and forward-looking information (collectively, “forward-looking statements”) within the meaning of applicable Canadian and US securities legislation. All statements, other than statements of historical fact, included herein including, without limitation, statements regarding the potential for new deposits and expected increases in a system’s potential, the timing for a revised preliminary economic assessment, the Company’s believe about the potential size of new deposits, anticipated content, commencement and cost of exploration programs, anticipated exploration program results, the discovery and delineation of mineral deposits/resources/reserves, the potential to develop multiple YellowJacket style high-grade zones, the Company’s belief that the parameters used in the WhittleTM pit optimization process are realistic and reasonable, the potential to discover additional high grade veins or additional deposits, the potential to expand the existing estimated resource at the North Bullfrog project, the potential for any mining or production at North Bullfrog, are forward-looking statements. Information concerning mineral resource estimates may be deemed to be forward-looking statements in that it reflects a prediction of the mineralization that would be encountered if a mineral deposit were developed and mined. Although the Company believes that such statements are reasonable, it can give no assurance that such expectations will prove to be correct. Forward-looking statements are typically identified by words such as: believe, expect, anticipate, intend, estimate, postulate and similar expressions, or are those, which, by their nature, refer to future events. The Company cautions investors that any forward-looking statements by the Company are not guarantees of future results or performance, and that actual results may differ materially from those in forward looking statements as a result of various factors, including, but not limited to, variations in the nature, quality and quantity of any mineral deposits that may be located, variations in the market price of any mineral products the Company may produce or plan to produce, the Company's inability to obtain any necessary permits, consents or authorizations required for its activities, the Company's inability to produce minerals from its properties successfully or profitably, to continue its projected growth, to raise the necessary capital or to be fully able to implement its business strategies, and other risks and uncertainties disclosed in the Company’s 2014 Annual Information Form and latest interim Management Discussion and Analysis filed with certain securities commissions in Canada and the Company’s most recent filings with the United States Securities and Exchange Commission (the “SEC”). All of the Company’s Canadian public disclosure filings in Canada may be accessed via www.sedar.com and filings with the SEC may be accessed via www.sec.gov and readers are urged to review these materials, including the technical reports filed with respect to the Company’s mineral properties. NI 43-101 is a rule developed by the Canadian Securities Administrators which establishes standards for all public disclosure an issuer makes of scientific and technical information concerning mineral projects. Unless otherwise indicated, all resource estimates contained in or incorporated by reference in this press release have been prepared in accordance with NI 43-101 and the guidelines set out in the Canadian Institute of Mining, Metallurgy and Petroleum (the “CIM”) Standards on Mineral Resource and Mineral Reserves, adopted by the CIM Council on May 10, 2014 (the “CIM Standards”) as they may be amended from time to time by the CIM. United States investors are cautioned that the requirements and terminology of NI 43-101 and the CIM Standards differ significantly from the requirements and terminology of the SEC set forth in the SEC’s Industry Guide 7 (“SEC Industry Guide 7”). Accordingly, the Company’s disclosures regarding mineralization may not be comparable to similar information disclosed by companies subject to SEC Industry Guide 7. Without limiting the foregoing, while the terms “mineral resources”, “inferred mineral resources”, “indicated mineral resources” and “measured mineral resources” are recognized and required by NI 43-101 and the CIM Standards, they are not recognized by the SEC and are not permitted to be used in documents filed with the SEC by companies subject to SEC Industry Guide 7. Mineral resources which are not mineral reserves do not have demonstrated economic viability, and US investors are cautioned not to assume that all or any part of a mineral resource will ever be converted into reserves. Further, inferred resources have a great amount of uncertainty as to their existence and as to whether they can be mined legally or economically. It cannot be assumed that all or any part of the inferred resources will ever be upgraded to a higher resource category. Under Canadian rules, estimates of inferred mineral resources may not form the basis of a feasibility study or prefeasibility study, except in rare cases. The SEC normally only permits issuers to report mineralization that does not constitute SEC Industry Guide 7 compliant “reserves” as in-place tonnage and grade without reference to unit amounts. The term “contained ounces” is not permitted under the rules of SEC Industry Guide 7. In addition, the NI 43-101 and CIM Standards definition of a “reserve” differs from the definition in SEC Industry Guide 7. In SEC Industry Guide 7, a mineral reserve is defined as a part of a mineral deposit which could be economically and legally extracted or produced at the time the mineral reserve determination is made, and a “final” or “bankable” feasibility study is required to report reserves, the three-year historical price is used in any reserve or cash flow analysis of designated reserves and the primary environmental analysis or report must be filed with the appropriate governmental authority. U.S. investors are urged to consider closely the disclosure in our latest reports and registration statements filed with the SEC. You can review and obtain copies of these filings at http://www.sec.gov/edgar.shtml. U.S. Investors are cautioned not to assume that any defined resource will ever be converted into SEC Industry Guide 7 compliant reserves.